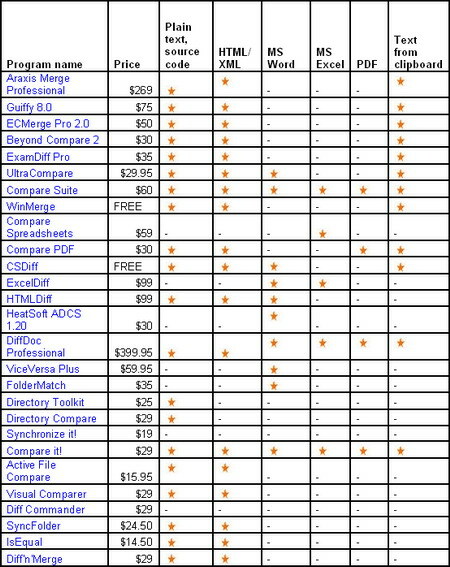 Most comparison tools allow you to compare plain text, source code, and HTML/XML files. Some programs require additional converters for comparing .DOC, .XLS, and .PDF files. Converters typically do not preserve original formatting of the file. In some programs, the user can compare unsupported files by copying its contents to clipboard and then pasting it in the program comparison panel. Among the software reviewed on our site, we would like to note outstanding visual comparison functionality for image files in ECMergePro 2.0. We would also like to note MS Word and Excel comparison functionality in Compare Suite. Unlike other software, Compare Suite allows you to compare MS Word and Excel files visually, with no additional converter required. You can find complete analysis of all comparison tools reviewed on this site, in our Buyer’s Guide. Learn more about how to do documents comparison fast, how to compare various types of files and find differences efficiently.